According to The Royal Chronicles of Ayutthaya the foundation of Ayutthaya followed an outbreak of smallpox in the neighbouring city of Kampucha (possibly the Khmer city of Lopburi). People fled the city and King U Thong marched his own troops for several days until they came to a great river. On the other side of the river, they beheld a large flat circular island. 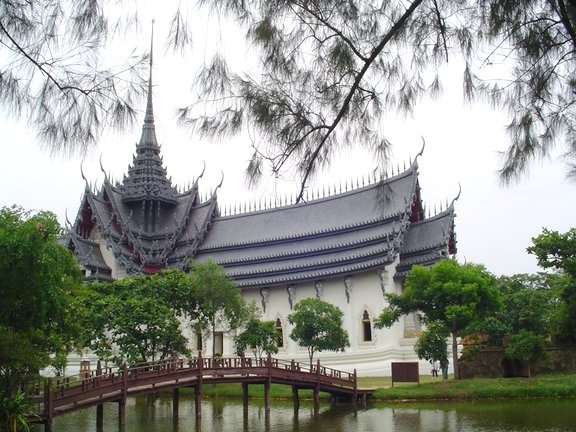 On this island (in the rainy season it can be a very convincing island, with surrounding paddy flooded for miles in every direction) he founded his new capital Ayutthaya which became the major kingdom of the central plains of Thailand between 1350 and 1767 C.E. Though periodically ravaged and sometimes occupied by the Burmese, Ayutthaya was, for several centuries, an important international cultural and political center, controlling most of Thailand's trade and contact with the outside world. This era ended in 1767 when the Burmese sacked the city and led away much of its population as slaves, the city itself returning to the jungle. As late as 1904, J. Antonio reported that some of the most interesting ruins were surrounded by dense jungle. However, in 1976, the site was declared a historical park, and ground clearing and some renovation work have given us some idea of the glory of the original city. Unfortunately much of Ayutthaya, including the grand palace, had been reduced to its foundations by the Burmese and remains so today. In 1991 UNESCO designated Ayutthaya as a World Heritage Site, therefore a site "of outstanding value to humanity". Ayutthaya is located about 90km North of Bangkok on both the Northern and North Eastern railway lines, so trains are quite frequent; journey time is about 90 minutes. The railway station is located to the east of the old city, on the eastern side of the Pa Sak River. A ferry from the railway station pier takes you to Chao Phrom market, and from there, the remains of the old city are about 1km to the west. There are also frequent buses from Bangkok and other parts of Thailand, but the most luxurious way to get there is by boat from the Oriental Hotel in Bangkok: this is a full day trip, one way by boat, one way by air-con bus. Price is around 1,300 Baht per person. The old city was built on an island formed by the Chao Phraya river to the west and south, the Pa Sak river to the east, and the Lopburi river protecting most of the northern part of the city. A canal from the Lopburi River to the Pa Sak river completes the ring of water. 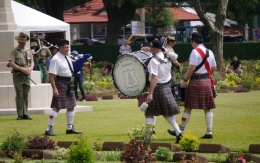 The city measures approximately 4km from west to east, and 2km from north to south. Walking is a good way to explore though Tuk Tuks and Song Thaews abound. Alternatively bicycles can be hired for 30 Baht per day, Motor Cycles for 200 Baht per day. Entry to the major historical sites is very reasonably priced at 30 Baht per person. Many people make a day trip from Bangkok, but reasonably-priced accommodation is also available in the city. In the small street down to the ferry, and on both sides of the river are guest houses with prices from 150 Baht to 600 Baht. There are also luxury hotels within the city itself. 12th century inscriptions suggest that there was a city on this site prior to its official foundation by King U Thong (Ramathibodi) in 1351. The name Ayutthaya derives from the Hindu "Ayodhya", city of the Hindu god Rama in the Ramayana (early western visitors such as Jeremias Van Vliet seem to have missed the association and called the city "Judia" or "Judea"). 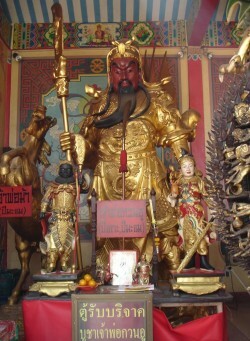 Thai kings have traditionally been associated with Rama. The current Chakri Dynasty, which dates from 1782, are known as Rama I through to Rama 9, the current monarch. Ayutthaya at first was one principality among many, the major powers of which were Pegu in Burma, Lan Na, Sukhotai and a declining Angkor, but Ayutthaya grew quickly and at the height of its power, during the reign of king Naresuan (1656-1688), controlled parts of Burma, much of Lan Na and Cambodia, and projected influence over most of the Malay peninsula. During the 17th and 18th Centuries several European countries, together with China and Japan, established trading houses in the foreign quarter of Ayutthaya. The most famous of the Europeans was Constantine Phaulkon (1647-1688), a British seaman of Greek parentage, who became first minister to King Narai and one of the most powerful men in the kingdom. Unfortunately once his king and protector fell ill, Phaulkon was overthrown and executed by a group led by the king's brother. After this time, European influence in Thailand declined sharply. Some idea of the grandeur of Ayutthaya in its golden age, can be seen in a reconstruction of the royal palace Sanphet Phrasat at "The Ancient City" (Meung Boran), south of Bangkok. Head westwards on Naresuan Road (north of the market) for about 1200m, and through the second major intersection. To the right are the remains of Wat Ratburana (15th C), to the left the extensive ruins of Wat Mahathat - "Temple of the Great Relic". Much of the site, which dates from the 14th century, was destroyed by the Burmese in 1767. The Buddha statues have also suffered very badly, most of them being beheaded by vandals and robbers, though some heads have been replaced in modern times, carved skillfully in the style of the Ayutthaya period. In the photograph above, the head exists but the body has disappeared. 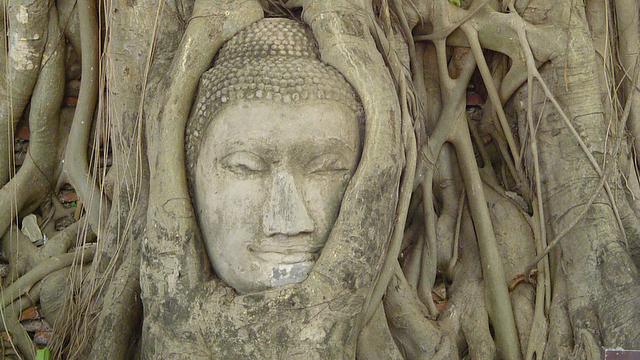 This sandstone head from the Ayutthaya period rests appropriately in the climbing roots of a Bodhi tree in the grounds of Wat Mahathat. West of Wat Mahathat is a very pleasant park, with lakes and bridges. The path passes several smaller historical remains and provides fine distant perspectives of Wat Mahathat, as in the photograph above. A short walk brings you to Wat Sri Sanphet and the remains of the old Royal Palace (Wang Luang), dating from the time King U Thong (Ramathibodi), 1351-1369. 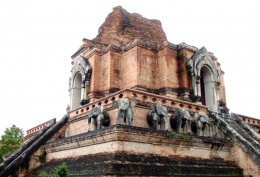 Though there is very little left of Wang Luang itself, within the palace grounds are the much better preserved remains of Wat Phra Sri Sanphet, the royal temple. 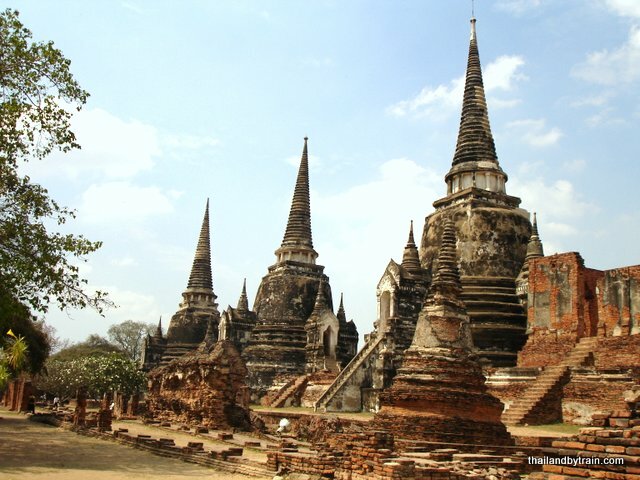 Three chedis in the temple grounds contain the ashes of three early kings of Ayutthaya from the second half of the fifteenth century; this line of massive monuments has become one of the most famous and evocative images of Ayutthaya and of historic Thailand. To the north of the palace ruins, and just across the river, is Wat Na Phra Men, an early 16th century Wat from the time of King Ramathibodi II, apparently the only temple not to be destroyed by the Burmese. 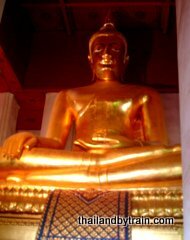 The Ubosot houses a famous bronze Buddha image of the early Ayutthaya style; the 6 meter high image shows the Buddha seated in the Lotus position, crowned and wearing royal regalia. The small side-hall (Wiharn Noi), houses Phra Khandaharat, a large sand-stone Dvaravati period (6th to 13th Centuries) Buddha, taken from Wat Mahathat. The figure is seated in european fashion and measures 1.7 meters in width, and 5.2 meters in height. It is believed to have been brought back from Sri Lanka by Thai missionary monks. The inner walls of the wiharn are covered in murals, unfortunately in a very delapidated condition. Head back south along Sri Sanphet Road. Just south of Wat Sri Sanphet is Wat Mongkhol Bophit, a single late Ayutthaya Wiharn built to house the 15th Century Phra Mongkol Bophit, a huge bronze Buddha statue, 9.5 meters accross the lap, and 12.45 meters high, not including the pedestal. The present building was completely renovated in 1956, and is only just big enough to house the statue. Photographs around the inside of the wiharn show the delapidated state of the original Ayutthaya building prior to its restoration: the great black Buddha image stands in the center of the ruins, under an open sky. After the rebuilding of the wiharn the great bronze statue was entirely covered with gold leaf to give it its current splendor. Also within the wiharn are several fine old Buddha heads, rescued from the ruins of the old city. A further few hundred yards south, on the left hand side is Chao Sam Phraya National Museum. This is the largest of the city's museums and contains a wealth of artifacts from Ayutthaya's golden age. The final two destinations are a little bit out of the way, but not to be missed. Take a Tuk Tuk back eastwards to the river along Rojana Road. Cross the river, then turn south. Follow the course of the river to Wat Phanan Choeng. Wat Phanan Choeng is a large temple complex located at the confluence of the Chao Phraya and Pa Sak Rivers. A temple has existed on this site since before the foundation of the city, but has been renovated and extended many times, especially in the last few years when the growing properity of the Thai and Thai-Chinese middle classes has led to a big increase in funds for buildings and imagery - contributions to a Buddhist temple, or statue, are considered highly meritorious. The Chinese connection is very clear: the temple grounds contain several popular Chinese Buddhist shrines and many images: fat Buddhas, Kuan Yin, Kuan U (seen on the right) and many others. There are also statues and carvings of Brahma and Ganesha (the elephant god) and other Hindu deities, standing life-size amongst the profusion of Thai Buddhas, Yakshas, full-size elephants, and rows of bronze bells: the site is a glorious melange of styles, colors, and traditions. Wat Phanan Choeng is extremely popular among Thais, a functioning temple where local people and pilgrims from all over Thailand, go to make merit, meditate and ask for good luck (weekends are particularly busy). 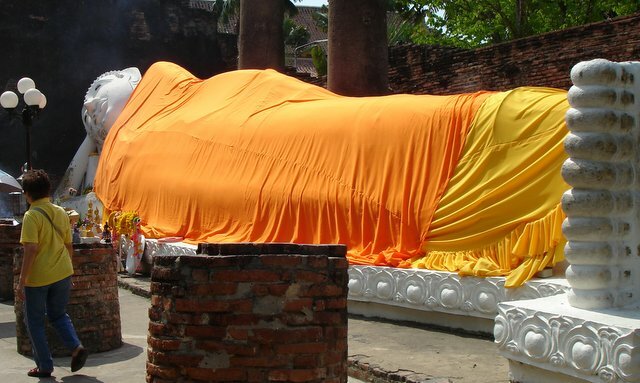 The most important feature, and center of pilgrimage is a huge (19m high) 14th century Buddha, Phra Chao Phanan Choeng, housed in the main Wiharn. The interior is illuminated only by the hundreds of candles lit by the devout; a soft golden glow reflects from the enormous guilded statue and the smaller attendant images - magical! 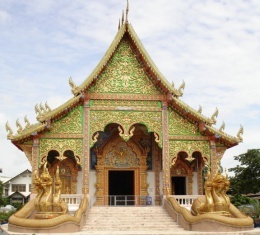 Follow the 3477 road north from Wat Phanan Choeng to Wat Yai Chai Mongkhol, a large well-preserved temple complex. The main feature can be observed from some distance away, and also very clearly on Google Earth: this is the massive 60 meter high chedi: Phra Chedi Chai Mongkhol. This huge structure contains a central shrine, accessed by a steep stairway - a climb well worth the effort as, from the upper terrace, you have an excellent view of both the rest of the temple complex and also the surrounding countryside. Wat Yai Chai Mongkhol is believed to date back to the reign of King U Thong, though its current name dates from the time of the warrior King Naresuan (1590 to 1605) who constructed the huge chedi to celebrate his victory over the Burmese. The early Ayutthaya style ubosot faces the great Chedi; with, in between, a row of seated Buddah figures clad in yellow robes. 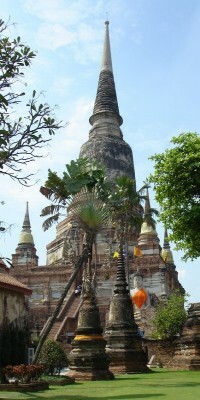 To the side of the great chedi are many smaller ones, some in good repair, and also several fine stone Buddha figures. In the grounds can also be found a large sleeping Buddah figure, also from the time of King Naresuan, and several beautiful teak built kuti (monks' living quarters), underlining the fact that from 1957 when the temple was renovated, this was once again a functioning temple. Rather more whimsical, though still interesting, are the old bullock carts in the temple gardens, one complete with full size wooden bullocks. King Naresuan the Great is much celebrated in Thai history for freeing the country from the yoke of the Burmese. 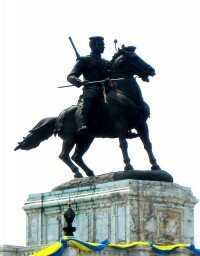 A most impressive equestrian statue of the King can be found to the North West of the old city. A five minute Tuk Tuk ride takes you back to the Railway Station. The gateway to Laos, a typical Thai border town with Border Market, Backpacker Hotels and busy river life. 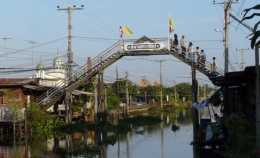 A tour of Koh Kret, an island in the Chao Phraya River in Nonthaburi district, some 17 km north of central Bangkok. 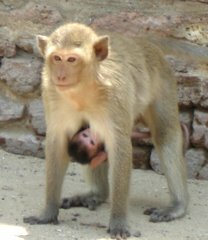 Historic Lopburi with its superb Khmer remains, Mini Guide and Map, watch out for the monkeys! Guide to Chiang Mai, the ancient capital of Lan Na (Lanna). The central walled area ia abiut 1 square mile and full of great beauty and history.